Flying west out of Dillingham we watched the spruce tree line recede behind us and we passed beyond into a tundra landscape of low heather, sphagnum moss, and willow lined salmon streams. 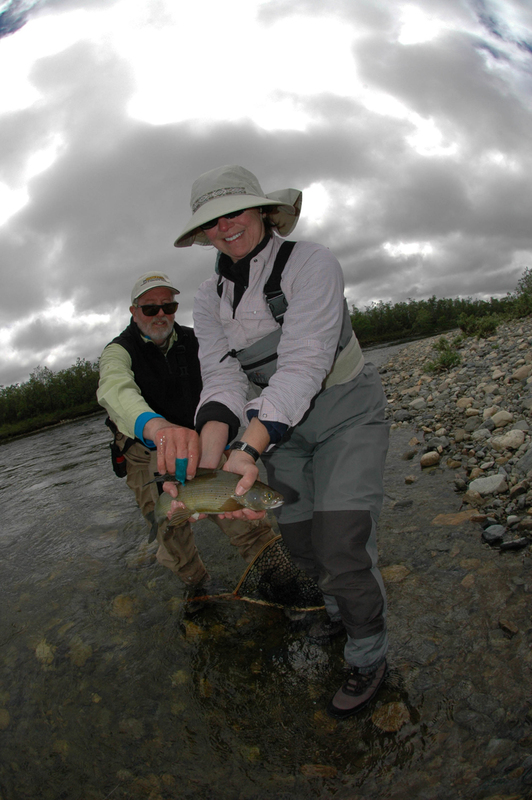 Linda & John Murphy & Eric Oster had come to fish in solitude for Rainbow Trout, Arctic Grayling and if the timing was also right for King Salmon and Sockeye Salmon. Access to the South Fork generally exacts some toll on participants and rafting gear. 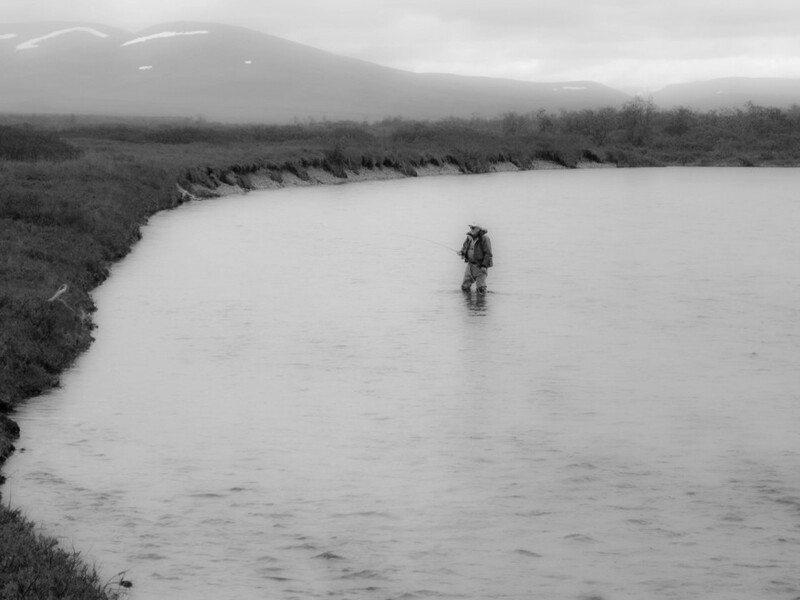 That day we individually paid our toll by working hard to push, pull, and finally to row our two rafts across a magnificent post glacial landscape. By late evening we were camped on the South Fork. A glass of wine. A ration of Ibuprofen, then rods were strung up and 8 days of fishing began. 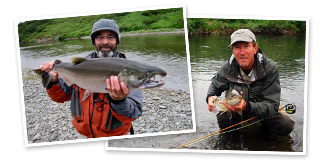 The first float of a river in the season is such a special adventure because there is no information as to how spring floods have changed the river and of course the salmon are just entering the system so one strains to see the first bright fish. There is no fly shop for 250 miles so we will be the first to know how the fishery is doing! 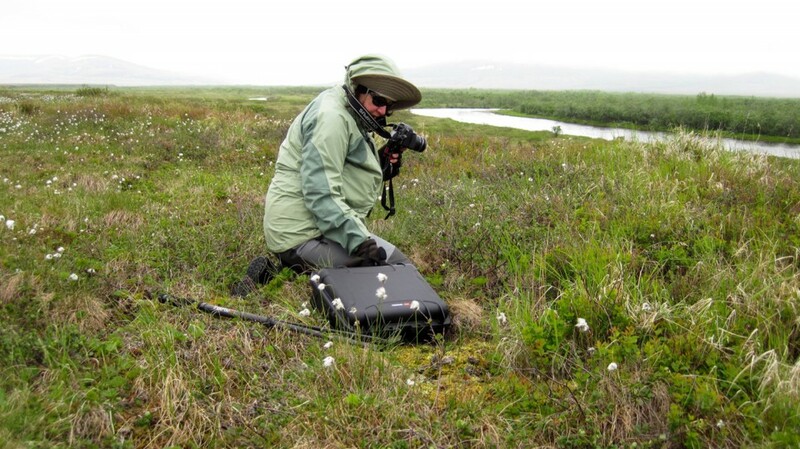 Linda Murphy with her Pelican box full of Canon digital SLR cameras and lenses was focused on the landscape, the light, and nature. 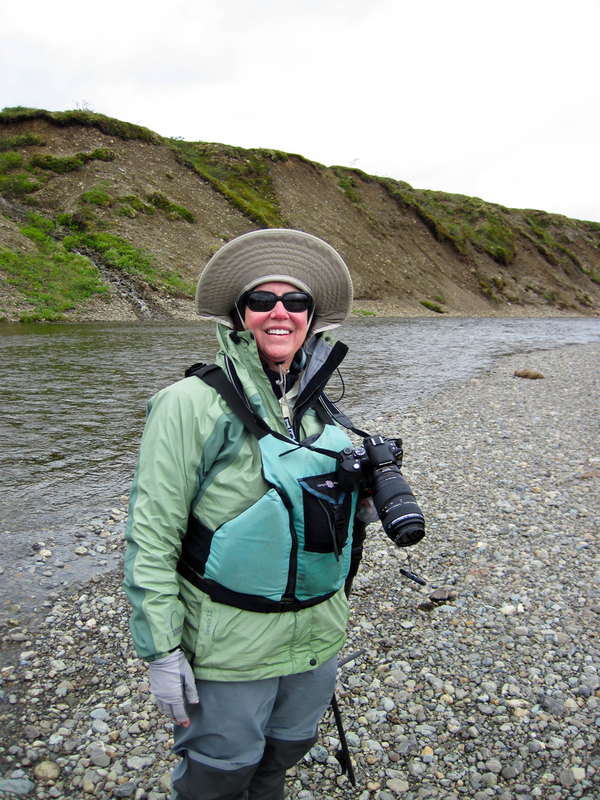 She has come all this way to spend a week enjoying the tundra landscape while her husband John fly will fish his way across the same landscape. 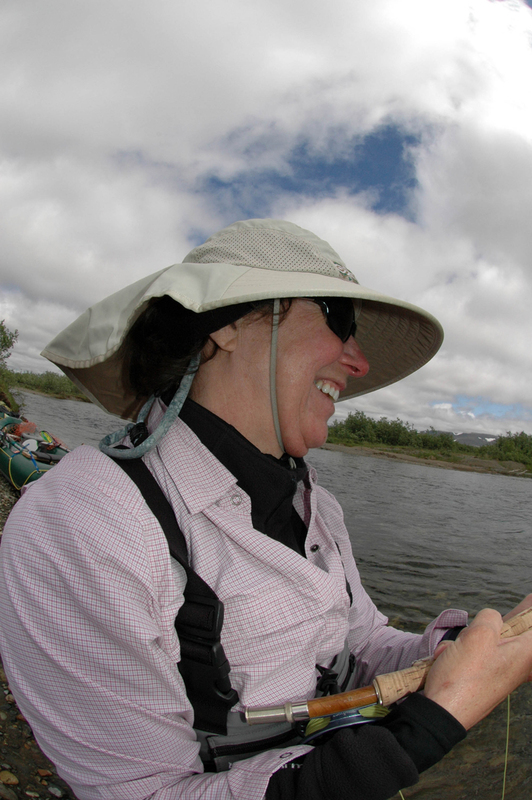 One wonders how Linda’s experience, the non-fishing spouse will compare to the fly caster? Our third participant, Eric Oster has left his work in the financial hub of the universe, NY/NY to “step up” his angling from New England Small Mouth Bass and native Brook Trout to carnivorous Rainbows and perhaps tackle testing Salmon. With a week of travel ahead and the unknown vagaries of weather, insects, salmon run timing we went to sleep that first night eager to experience what our future held in store. 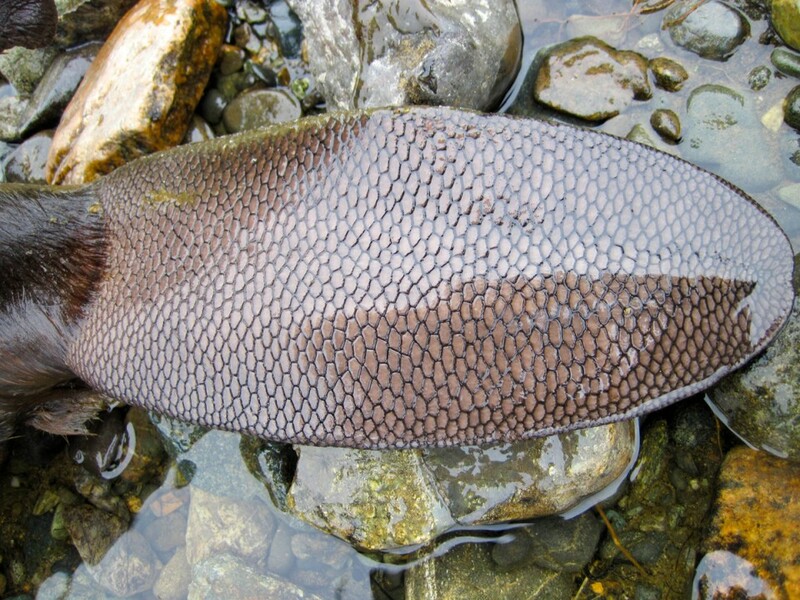 Arctic Grayling and Rainbow trout came to the net as the rolling tundra hills and mountains receded and the two rafts rowed down river. 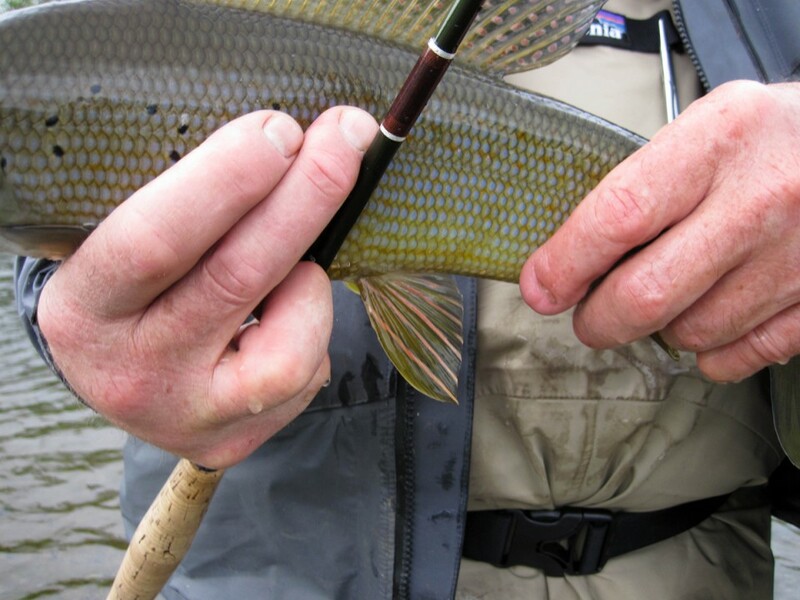 Fishing in June for the resident trout and Grayling is similar to searching for springtime trout on the bigger rivers of the American west. 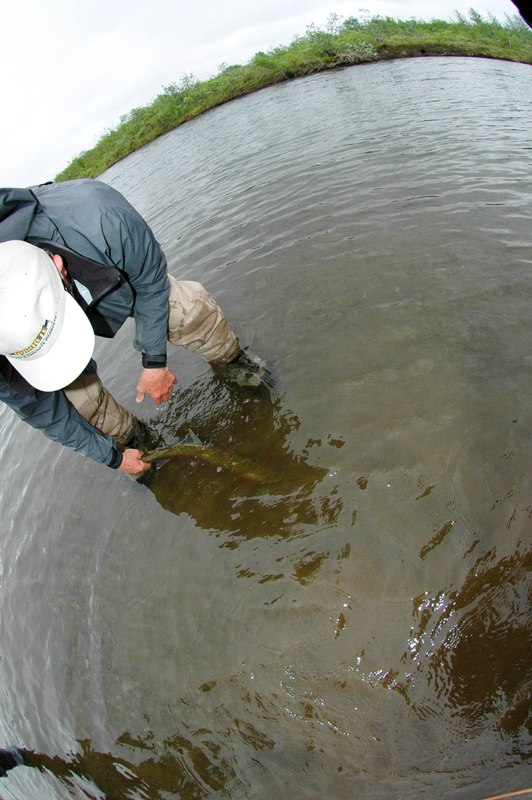 One throws streamers, smolt, and various leech-based attractors while one is ready to switch to a caddis when Grayling are active on the surface. Wooly buggers and bead head nymphs can be productive but whichever choice, one keeps moving and switching flies until you find fish. While you move you throw to the deepest runs and into the woody debris, searching, searching, searching. 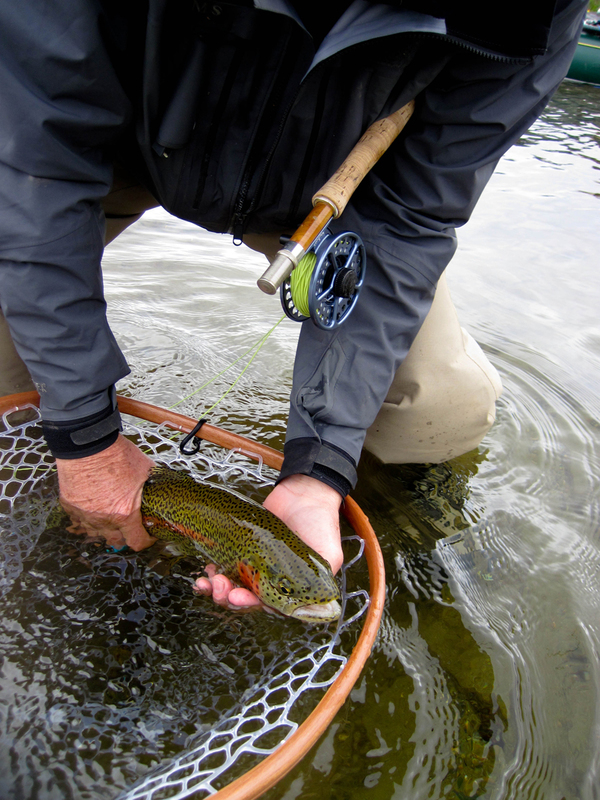 The rainbows in particular are widely distributed compared to their later seasonal focus on spawning salmon. 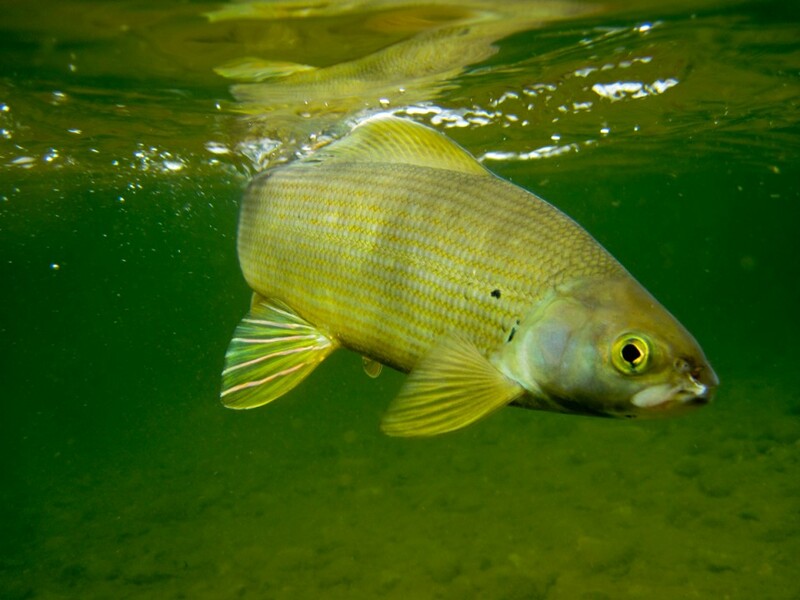 As we passed Deer Creek, Grayling were taken on the surface, and then where we camped among the feeding Bank Swallows the trout fishing picked up. We know that each mile should fish better than the last until we descend close to the estuary. From day 1- day 4 we saw no other signs of mankind. No camps or tracks on the beaches. We seemed to be the first group of 2011. 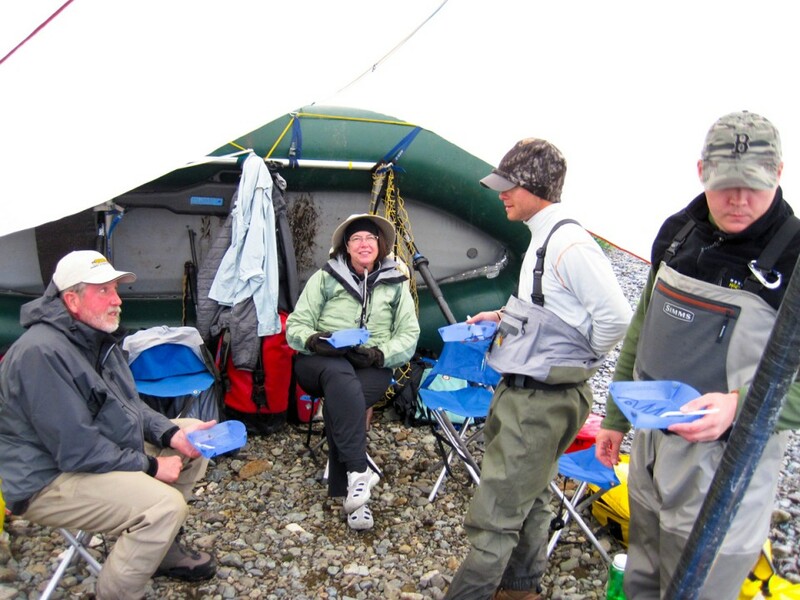 John, Linda, & Eric all had fine camp skills which made the daily routine easy and smooth for us all. We noted as we rafted and cast and photographed between our second and third camp that a historic Bald Eagle nest on river left had 2 adults in attendance. John caught a really fine rainbow at our third camp. Olly Merrill, our terrific guide and “right hand man” took a lovely twenty-two inch rainbow in our fourth camp with USFWS tag # 35051 behind its dorsal fin. 7 Rainbow and 17 Grayling taken on day four. We were becoming more efficient as we searched for the trout. On that 4’Th morning we awoke to a hard frost and clear skies! 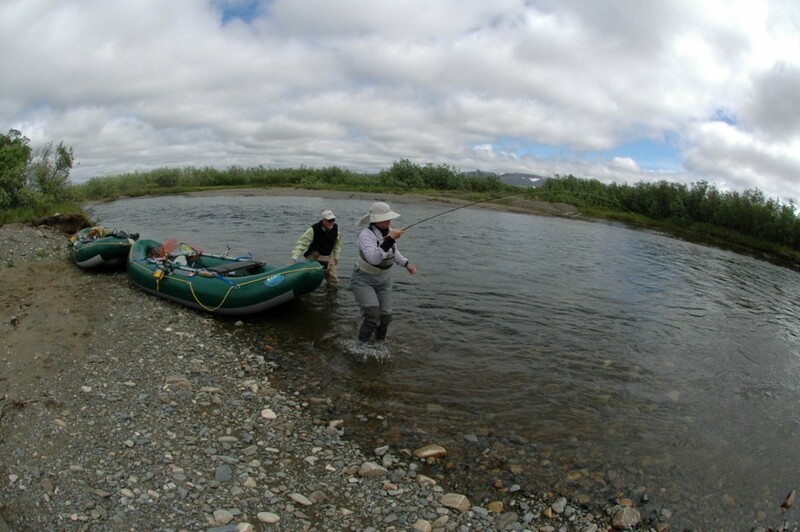 We descended down river by raft passing from the uplands characterized by rolling hills and small mountains with alpine tundra through a pass onto the coastal plain. 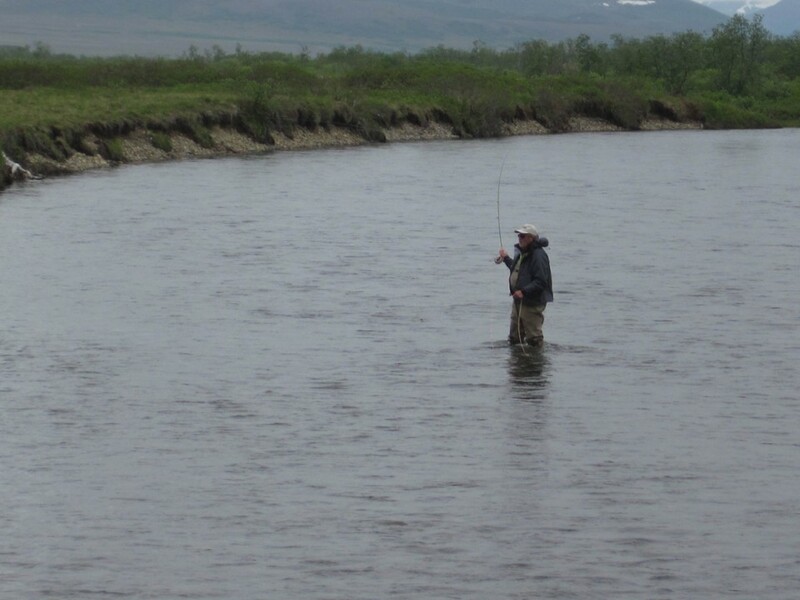 For the second one half of the trip we’d meander across the flood plain and the river would become an increasingly rich fishery as nutrients accumulated. As we left the mountains a diminutive Merlin (falcon) screeched her territorial alarm overhead. A pair of Tundra Swans flew past along the right riverbank and Linda took a notable Grayling at camp. 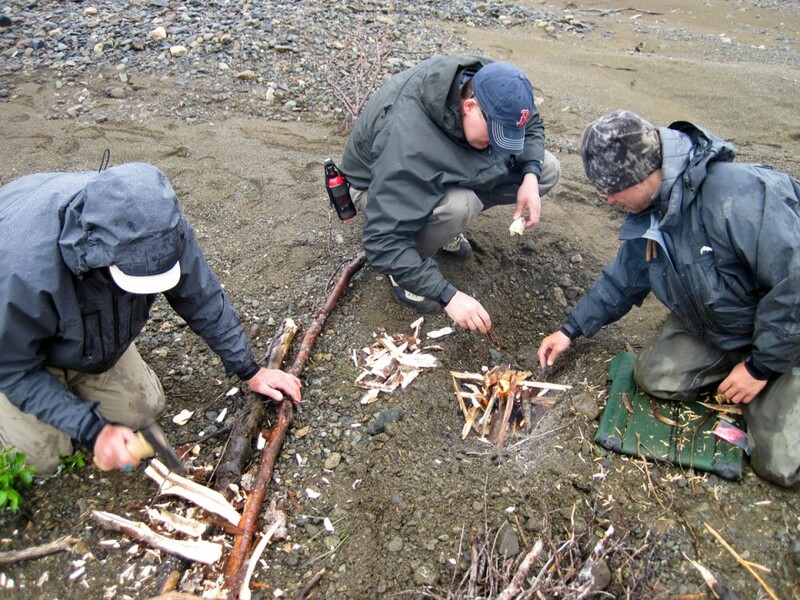 From the log of June 30, 2011: “First Sockeye Salmon seen but not caught… We fished mouse patterns most of the day”, throwing them at the wooded banks and stripping them back trying to make them seem both helpless and delectable. Eric was in my boat and he took 8 Rainbow Trout. 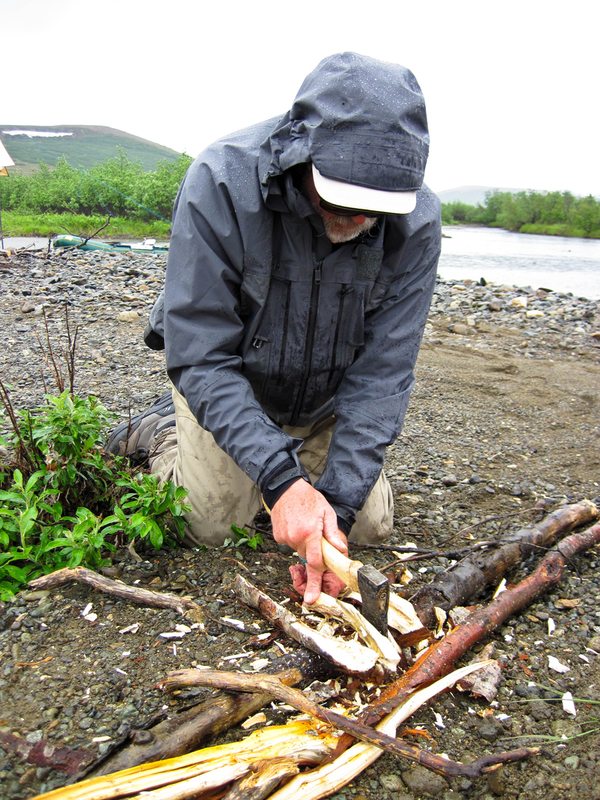 However no Arctic Grayling were brave enough to take the rodent from Eric. 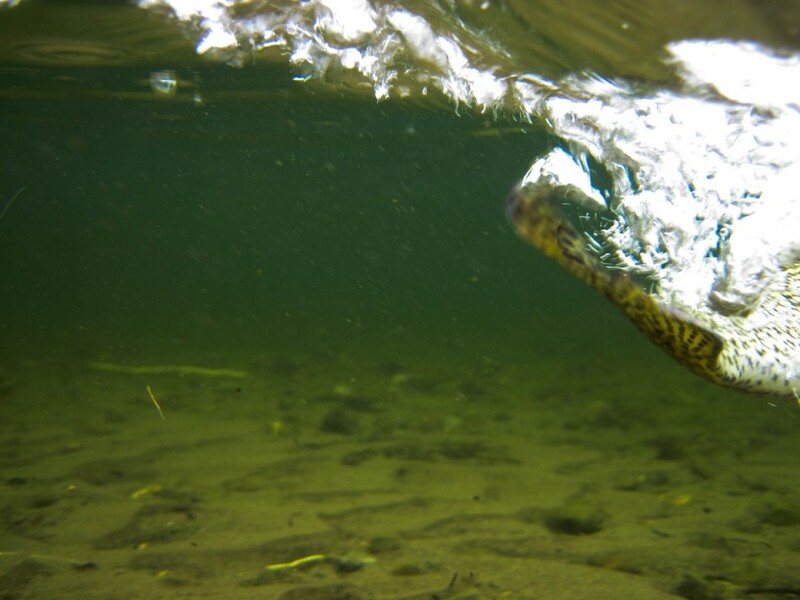 A white Starlight Leech with an orange head took fish as well for both boats. 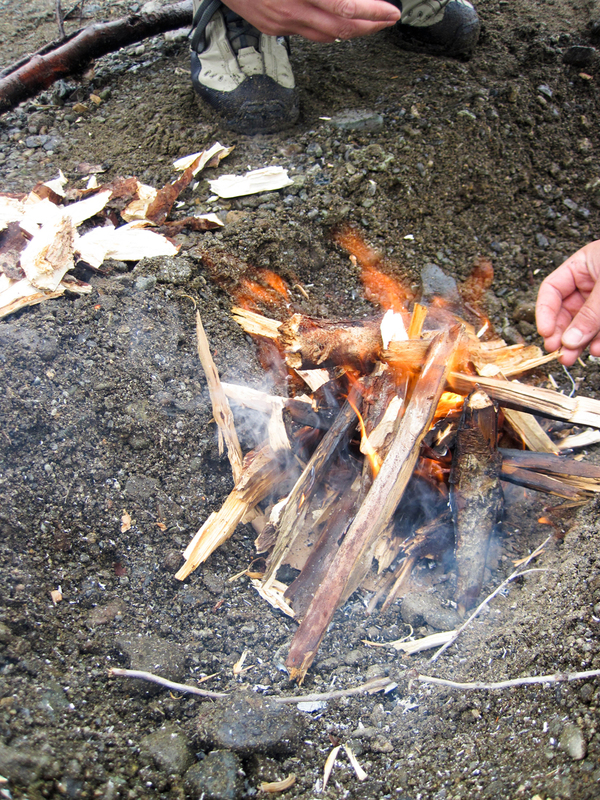 I noted in the log that we discovered a freshly killed Beaver carcass, first thing in the morning. 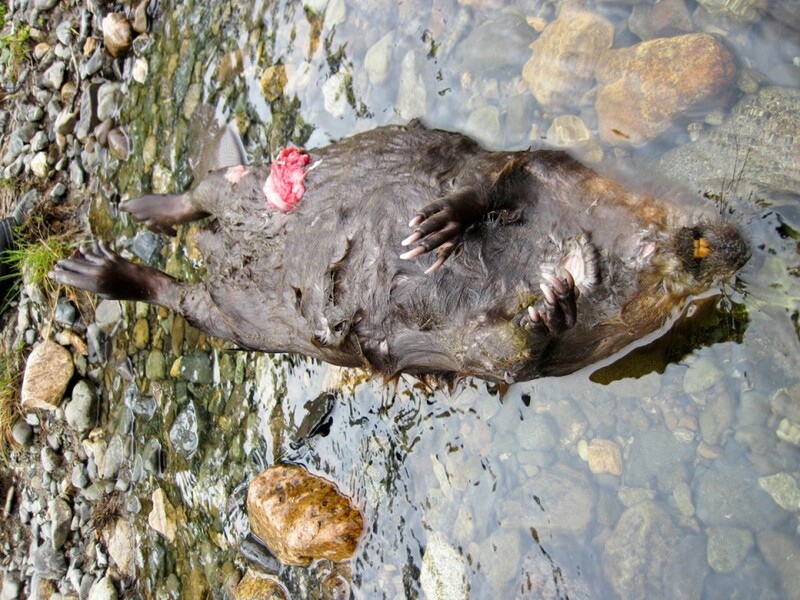 A Beaver carcass must be rare to find in the wild, as I’ve never seen one in over 35 seasons on Alaskan rivers. 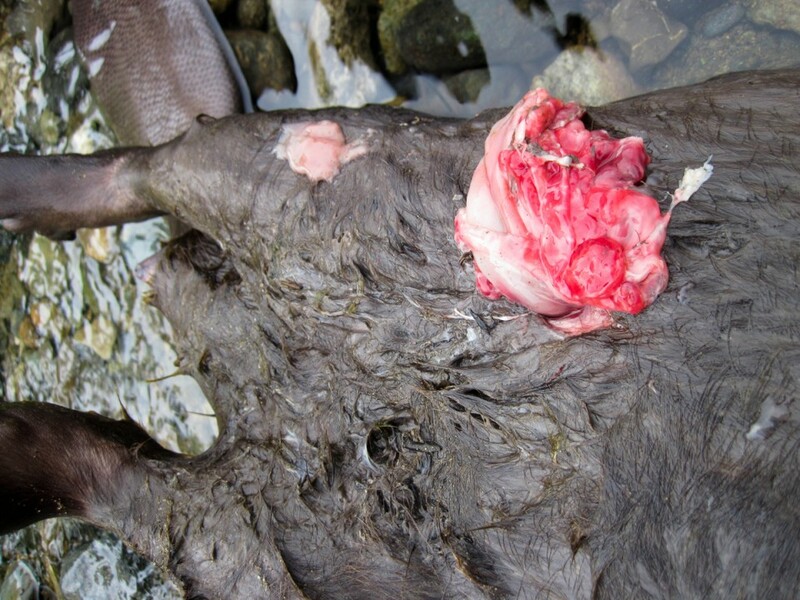 Beaver meat is so rich and fat that whatever predator killed it most certainly enjoyed the delicacy after we departed. In the late evening sun we laughed at the spectacle of an epic rock-skipping contest between participants but in retaliation the local Beaver colony slapped the water with their tails for most of the remaining nighttime. 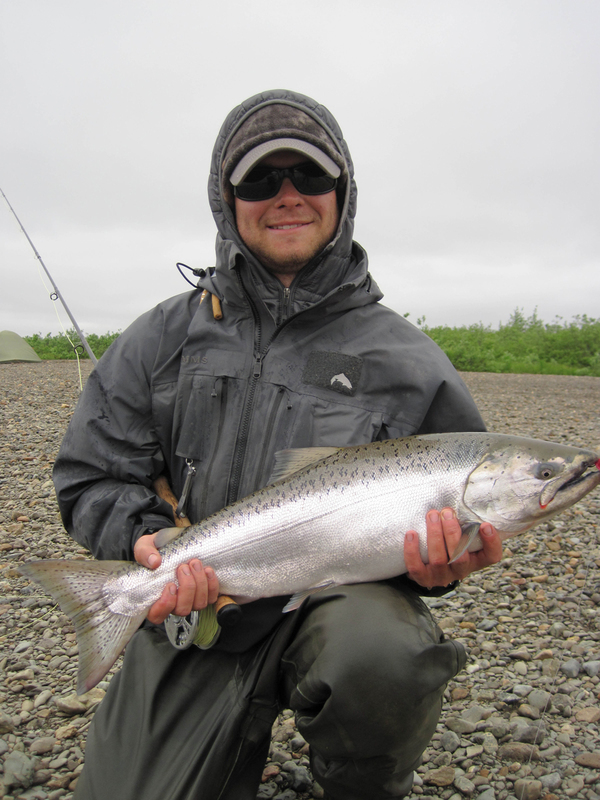 Finally on July 1 we hooked the first King Salmon of 2011. By day 5 we’d become such an efficient team that camp was packed effortlessly and we were on the water fishing for 8 hours. John & Linda fished with me and John took a really fine Rainbow in excess of twenty-four inches. We passed pods of Sockeye in the lower river, perhaps five hundred fish combined. Of King / Chinook we saw about 25 and of Chum salmon perhaps 50. Some Chum were in spawning coloration while the other salmon were bright. 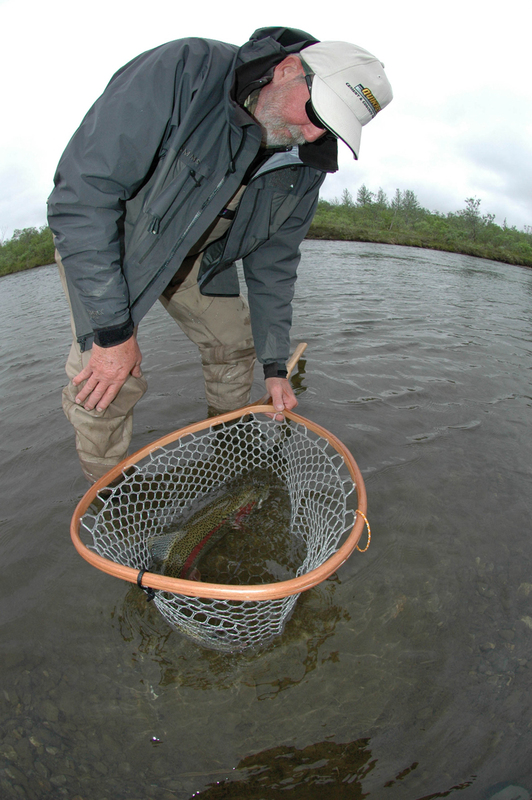 Now we had fishable numbers of salmon aggregated into holding water which is somewhat more important for catching Sockeye than Kings. Kings fresh from the salt are relatively aggressive and big leeches and marabou attractors will elicit a chase and a strike. 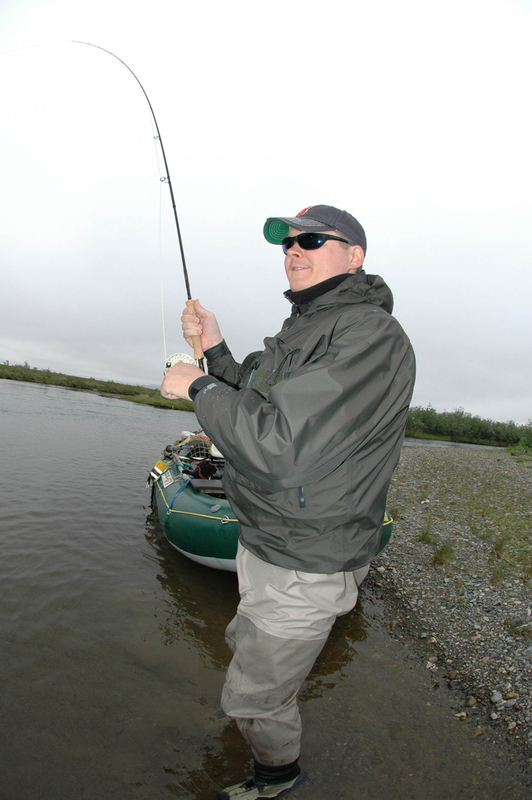 Not to make Kings sound easier than they are because one must be fishing for them mid channel in deeper runs, but the Sockeye is usually tougher to stimulate a strike response from. 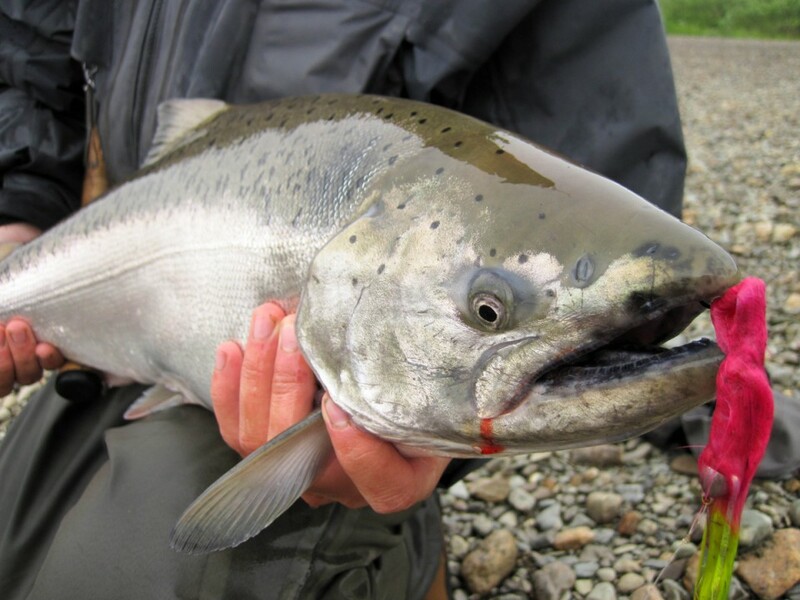 Yet when fresh Sockeye are “laid up” in a pod the alpha fish will attack the fly often enough. We took both species in the lower river, which after a week of focus on the resident trout and grayling species made for great diversity. 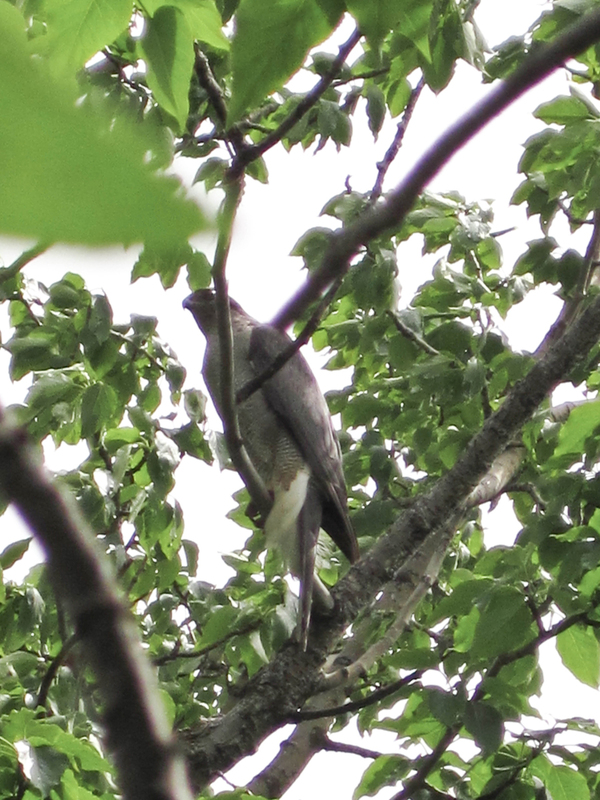 One afternoon as we floated, the shrieking of an Adult Goshawk defending her nest on the lower river surprised us. Here on the coastal plain, seventy-five miles west of the tree line, the largest of the North American forest hunting raptors had chosen to nest. The Black Cottonwood tree she’d built the nest in was barely 20 feet tall and the nest itself was only 10 feet above the ground. At least one chick was in the nest. We departed leaving her to tend her family. Later in the autumn I confirmed with a USFWS biologist that similar Cottonwood tree Goshawk nesting has been reported in the Yukon Kuskokwim delta to the north but that this was a first for this region. 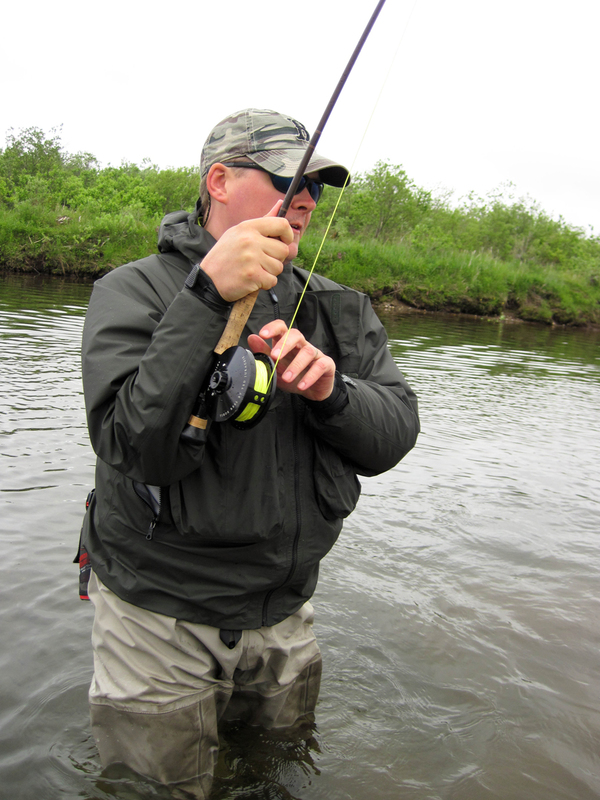 Final day on the river: “Erik caught everything!” 3 species of salmon, 2 Arctic Grayling, and 7 Rainbow Trout. Linda wore a huge smile along with her sun hat. And her camera captured the last of John’s fish and the estuary landform. John Murphy had a fine day too. Everyone worked hard all day with a smile. Who wouldn’t smile? The weather was stellar. The songbirds were singing all day plus the Semipalmated Sandpipers & Yellow Legs were shrieking from their sand bars. The Goshawk passed us tearing through the willows on the hunt. What a fine week!